Although I am aware of the existence of these MIJ single humbucker Fender Strats (I guess that they were a "Superstrat" of sorts) I've not previously seen one with the enlarged pickguard that we see pictured here. Seeing as the guitar has a backplate for the controls, I'm guessing that the pickguard is non-original and that this guitar would oringally not have had a guard at all. I suspect that the volume control has been moved from the usual position next to the pickup and the switches (coild tap and brighness) added, despite the fact that the seller claims the guitar is all original. Unless of course this is a Fender Japan model I'm not aware of. Does anyone out there know for sure? This guitar is currently listed on eBay with a low starting price. "I'm guessing that the pickguard is non-original and that this guitar would oringally not have had a guard at all." When avail. these seem to go in the neighborhood of $400 U.S. Being a fan of simple guitars, I think that without the big ugly white pick-guard it could be quite attractive. I'll just take this moment to say thanks to all you guys at Guitarz, been reading for years! Is that a Lead one Humbucker? 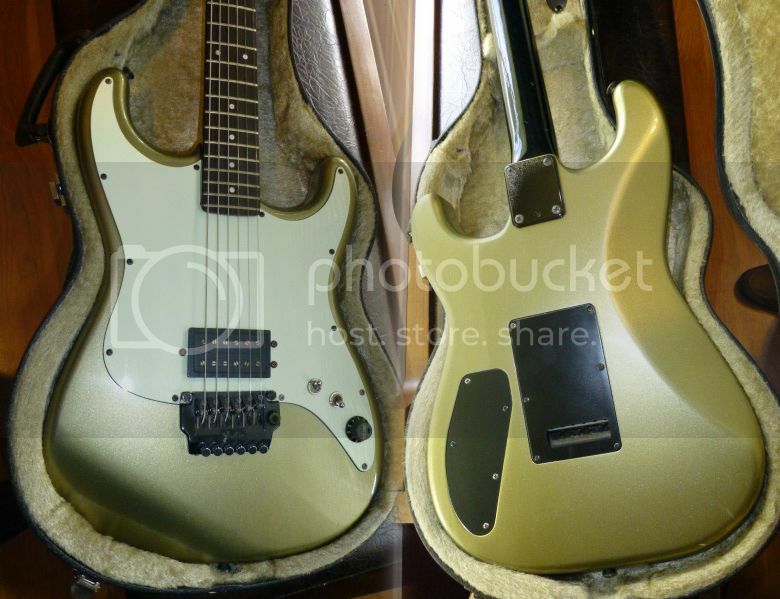 That is a Fender "Contemporary" model Strat, and I don't believe the pickguard to be original. The lower priced models had the black back necks. I remember lusting over one of these in the late 80's. It is a fender lead 1 pickup, indeed. 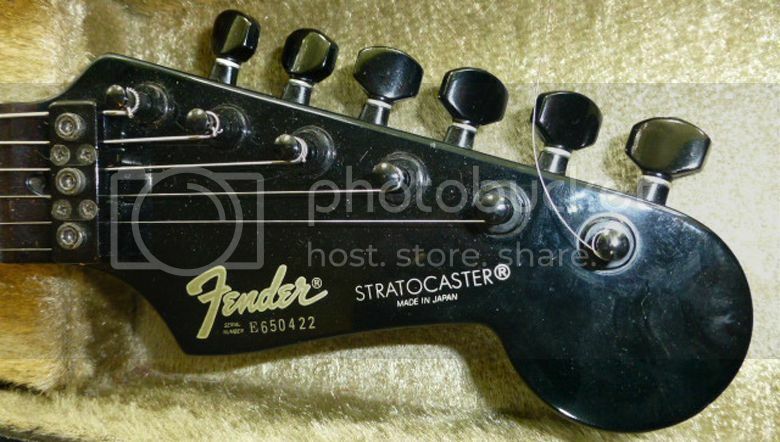 Hello, sorry for being out of topic but i 'm curious about the Fender Japan Stratocaster ST-650 SPL, ever heard of it? is that series really exist? 'coz i 'm now waiting the guitar to be ship to my place, meanwhile i can't find any further review / info about the series ST-650 SPL on the internet. is there anybody can help with the review ? Thanks. BTW the guitar is almost similar to the American Standard Strat Guitar, with Fender logo Peg and two point Bridge, and have a single string tree. I have just acquired one of these from a Joe Bonamass Garage Sale" & he signed it & I paid $175.oo & it came with a H/S case, it plays & sounds super great. It has a ding bin the front, but it's a groovy axe ! thanks 4 the info as I couldn't find it easily, but 5 thanks to this page, I now know its origin & price range... Thanks to ya'll ! ! ! I ALSO HAD IT SIGNED BY JOE IN THE PROCESS ! ! ! WHO WANTS TO BUY IT @ $500.OO. It plays great & it's got a EMG (not sure what # is ? )in it & it just screams wildly when molested ! ! ! Any takers..? All my best to all the guitarist out there..! I have one of these and it does have a pickguard. It's always been a weird animal. It has h-s-s with 5 way and a small coil split for the humbucker. It only has 1 tone and volume and the stock knobs were almost like standards but had the fender "f" and rubber grips on side of them. It also has output jack recessed in the bottom of the body instead of front mount and no jack plate. It has a Kahler trem that I can't find parts for. This guitar is extremely heavy and will really wear you down after extended play. Also the headstock paint matches body until you get it under a blacklight then they are 2 completely different colors. It has a higher serial# than the one above, #E7120xx and from what I found in the early 90's on it made between 1984 and 1987.